Odors and scents catch my attention immediately, frequently without any particular awareness on my part. Clearly, the years of professional cooking and multi-tasking in the kitchen have enhanced and refined my sense of smell. The ‘whiff test’, an essential component in my own culinary tool box, can be the crucial step in averting potential disaster or simply keeping me on track. If food is on the edge of burning, that horrid acrid smell is a toe-curling alarm. In baking with chocolate for example, each degree of doneness has its own fabulous set of aromas. And there’s nothing is better than the perfume of a perfectly ripe peach. In my new home I am completely captivated by all the deliriously heady fragrances emanating from my hillside and garden. I love deeply inhaling the pungent woodsy odor of our tall elegant cedar trees, each new rose offers its own personal sweetness, and I’m enthralled by the incredible vitality and freshness of lavender. A snip here and snip there, into the kitchen they come and soon the sublime scents of nature waft throughout the house. As my picked bounties fade all too fast I begin pondering ways to savor them longer, to preserve them. I carefully lay snippets of flowers and herbs about to dry and it’s not long before I have petals and bouquets everywhere. I really need to get this under control. Voila! Good Fortune arrives via Goodwill in the form of a food dehydrator, sans owners manual. On line research, input from friends, repeated trial and error, slowly I develop a rhythm of harvesting and drying my lovelies. Obvious here, potpourri is the next magical step in this mysterious escapade. Back to Goodwill, one large storage jar later and I’m in bu siness, all these mystical components merge into a fledgling concoction with personality and character. She is named appropriately after her motherland, Vida Lea Potpourri. I harvest glorious lavender and decide it is most definitely one of the key elements in my potpourri. I watch the rose bushes like a predator, waiting for the perfect time to capture their essence. In a heart beat lavish bouquets evaporate into small piles of dried petals. I spot tiny cedar cones sprinkled about the yard and gather them up, but hold them in abeyance, hoping for larger prototypes as time goes by. I pluck tendrils of sage which flourishes here, this provocative, musky element is an excellent addition. More dimension is still needed and I invite a few extraneous renegades – mandarin orange peel from Australia and cinnamon bark from my local Market of Choice (!). Another learning curve, I’m gleaning old collectible cook books and discover that back in the day, essential oils and orris root were used in potpourris to boost and stabilize their scent. I consult my friend Kathleen from my local Farmers Market, who also owns Pioneer Natural Soap Company and specializes in botanical products for the home. Together we create a unique oil blend especially for Vida Lea Potpourri. 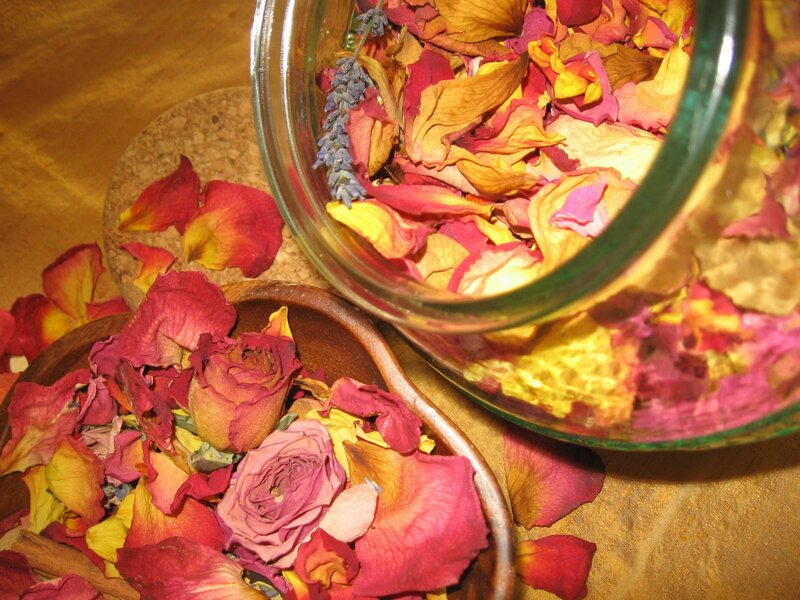 I add our oil blend and once a day give the potpourri a good shake to distribute the fragrance. The curing procedure will go on for several weeks before it is completely set. I smile at this remarkable abstract of nature in a jar – a richly scented myriad of colorful shapes and textures. Pure ambrosia. But wait! There’s an added benefit: by adding our signature oil blend to distilled water, I have instant Vida Lea Aroma Spray! My own personal cloud of lavender, cedar, rose, citrus and cinnamon for linens, beds and clothes! In theory, it would have been faster and easier to simply dash out and grab a bag or a bottle at the store. Then again, it is all about the process.